Which are the strategies undertaken to enhance the agri-food world? Which are the new tactics and technological innovations? How important is logistics for the ‘made in Italy’ industry. These and other topics were discussed during the workshop “Agri-Food Logistics, trends and innovation” held on the 28th October last, at Theatre of the earth of Biodiversity Park at Expo 2015. The event was organized by Kopron, which besides having a consolidated experience in industrial logistics known around the world, (with their production of loading bays, doors and fixed or retractable warehouses) are also strongly motivated towards innovation, in collaboration with the Contract Logistics Observatory of Milan Politecnico and the support of magazine “Logistica” edited by Tecniche Nuove. The aim of the workshop was to share strategies and actions to be undertaken for the development of the Agri-food Logistics, giving an outline of trends and suggesting new ideas to improve processes and to have a further awareness on how logistics is important in order to become more competitive. “Today the logistics sector plays a more and more fundamental role in helping industry to become really competitive on modern, global markets - explained Kopron Chairman, Paolo Vergani - In particular in the food sector, where Made-in-Italy products are on the front line, logistics suppliers can create value by offering a product handling system of high quality, aiming to save time and in compliance with safety standards”. 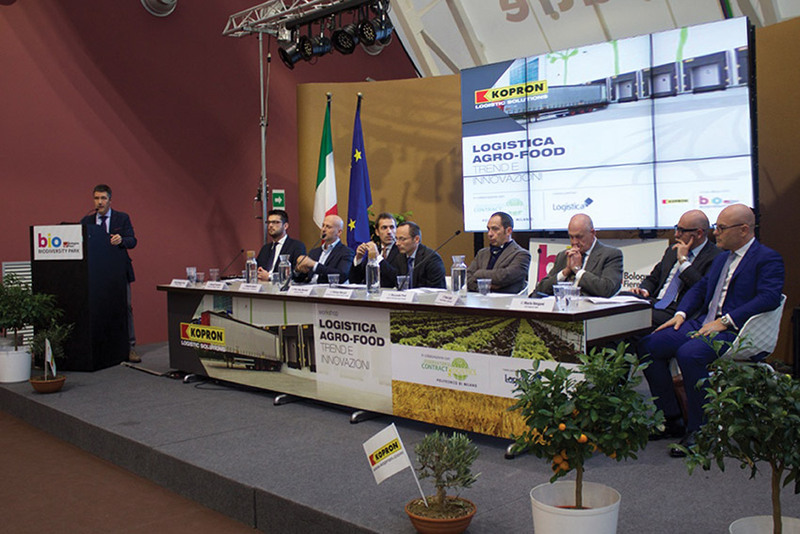 The current state of art of the agri-food logistics world was well explained by experts from Milan Politecnico. In particular Gino Marchet, Professor in Logistics and Scientific Director at the Contract Logistics Observatory, after an introduction by Alessandro Garnero, Director of magazine ‘Logistica’, explained: ‘more outsourcing processes, guaranteeing flexibility and cost saving, cross channel systems to detect new market opportunities and more attention to environmental low impact solutions, are the trends we managed to identify by studying the strategies and requirements of about 200 companies in the food sector with a turnover exceeding 50 million euros’’. At this point the opportunity to speak was given to the key players of the change and operators of the food logistics and transport sector: Mr Nicolò Passerini, Northern Area Manager at Number 1, spoke about their capabilities in innovation, but the approach to logistics regarding supply chains was mainly faced by Mr Roberto Alberti, General Manager at Brivio&Viganò, one of the most important representatives in the food Distribution and integrated logistics sector. He emphasized the importance to offer turnkey solutions aiming to maximize efficiency of supply chains. Mr Stefano Mercuri, General Mgr at Mercuri Angelo Frindes, who has always been one of Kopron’s partners, well explained how cold cycles are handled, bringing the attention to solutions which help avoiding temperature jumps during the delicate loading/unloading phase of perishable goods. Mr Paolo Calvi, Product Manager in Kopron, confirmed that “During loading/unloading of fresh or frozen food it is of fundamental importance to avoid temperature jumps from outside the building to inside’. The retractable loading bay, especially designed for cold chains, has become the ideal solution to save energy”. Kopron’s was among the most interesting interventions when they started to introduce their new AgroEnergy division. Mr Riccardo Pesi, the AgroEnergy Division Mgr, explained that “It is a unique Made in Italy project which aims to revolutionise the production either of leafy vegetables (like salad) or hanging types (like tomatoes or aubergines) or flowers. This result has been achieved thanks to the thirty-year experience built by Kopron in the logistics sector, in design and production of renewable energy plants and in greenhouse constructions. Besides they offer agronomic advice for customized and innovative systems which assure constant product growth in complete autonomy”. This allows us to have a mutually advantageous exchange of views aiming to constantly develop new, original and cutting edge technologies and solutions.